There are a number of blog/blogger awards. I began to think about my purpose for blogging. I mean the title of my blog reveals a lot about my mission: Believe Anyway. I have blogged before that I chose the title to remind myself to stay optimistic. My purpose is to light a candle in the darkness that envelopes us all at times. I want to lighten loads and light the way. I gravitate towards positive people and positive blogs. I want to start a blog award that reflects my love for the positive in the blogosphere. I call my award The Candle Lighter Award. 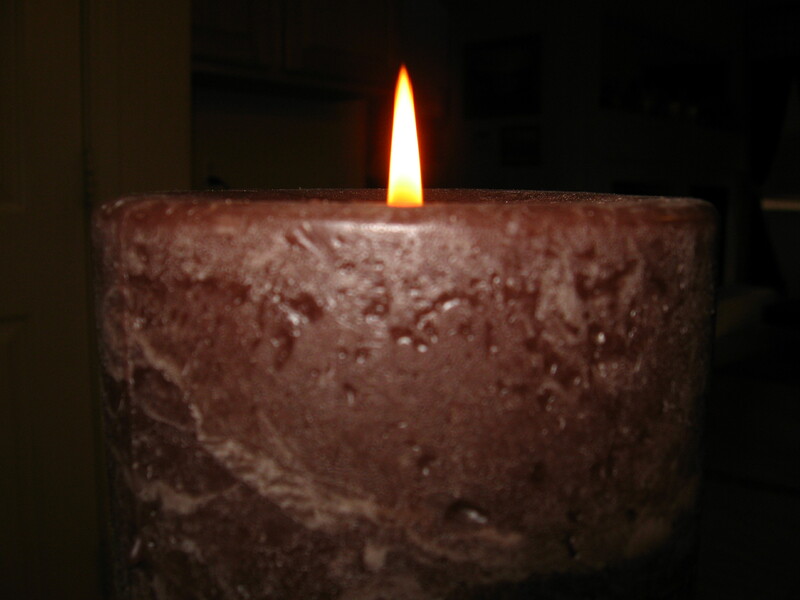 It is for blogs and bloggers that light a candle in the darkness with their blog. What does it mean? Whenever I see a post or blog that I think brings light to the world, I will put a copy of this post and give them The Candle Lighter Award. What does the recipient have to do to accept it? Just accept it and put the Candle Lighter Award badge from my blog onto their blog. Please put the link from this post about my creation of the award in a post on your blog so people can read about it. What else do recipients have to do? Nothing. If they do think someone else is a Candle Lighter, they can surely give them the award anytime they want and as often as they want. [i’d love it if you could send me the links for the blogs you do find worthy of the award, because I’d love to see their blogs, too! But it isn’t required]. Their is no limit to how many blogs you award The Candle Lighter Award to and no limit to how many times someone can receive it. But when you do, I ask that you use the link for this post. Let’s set the blogging world ablaze with Candles for all the positive oriented blogs. The world needs joy and lots of it. Why am I doing this? I think people that are going through the efforts to be positive and make the world better through their efforts and blogs deserve to be recognized. I am always looking for encouragement and ‘light’. I want my faith, my optimism, and my love for life to help to set the world ablaze. Hence: The Candle Lighter Award. I hope that you love this idea. This entry was posted in Awards and tagged inspiration, Optimism, postaday2011, postaweek2011, The Candle Lighter Award. Bookmark the permalink. Kate – here’s a comment I left on how to get the award into your side bar. Let me know if you need more help. thanks Nancy—once i get my awards given out for the day i will try that!! I relaunched my old blog into a resource for bloggers & diarists. My first post is how to add the badges to the sidebar. I encourage anyone to follow me that would be interested in writing prompts, journal jar ideas, and yes, some WordPress help. that is awesome, awesome, awesome. What a fabulous idea!! P.S. Love the idea!! What a great way to honor fellow bloggers! I love it! 🙂 My favorite blogs are those that make a positive statement. They deserve to be recognized for being optimistic without fault! CB I so agree!!!! Pass it along to whomever you wish whenever you wish. No requirement. No minimum. No maximum. I’d love to know who you pass it along to so I can mention them on my page called The Candle Lighter Award. Thank you so much for giving me The Candle Lighter Award. Thank you so much for the beautiful award. I have created a few like this myself as the “no strings” is a way to let other s know that their blog is amazing in and of itself, not just as a tool to create more connections (which is fine, but getting an award with no strings feels more like an award and not a ‘chain letter’). I am honored that you chose my blog to receive this beautiful creation of yours. Thank you. You’re welcome! How is the massive cookie baking round 2 coming along? hi Kate – i appreciate your outlook on life, and your wonderful idea of creating the Candle Lighter award. not sure if you had a chance to read my reply to your comment. just to reiterate, it is certainly a worthy award and it is very kind of you to encourage your fellow bloggers around the blogosphere, and all of that just because of wanting to express appreciation. how cool is that. i knew that you didn’t generally accept them. but just the same, i did want you to know that you do bring light to my corner of the world just the same. Kate, you are too kind. You light the darkness with your goodness and your ‘believe anyway’ spirit. Gwen–thank you so very much. And you are most welcome! Hi, Kate, Here is the link to my post about the Candle Lighter’s Award, along with the list of bloggers I chose to start. Great idea! i LOVE what you did with the candle and i LOVE how you are spreading and encouraging people with the light. and likewise I am proud to have you as a Candle Lighter! Your talent is SO impressive…. Thank you so much my dear. Have a blessed Christmas! You are welcome. You deserve it for your joyous blog. Merry Christmas. Merry Christmas to you and yours. Your blog and words are an inspiration. Kate – What a completely lovely idea! I haven’t received the award, but I read about it on Memories of Caleb. He is a light – as are you! I hope your Christmas was very merry – it sounds like it was, and I wish you a joy-filled New Year! You are about to receive the award from me!! God bless you and your beautiful blog! I am heading right there to read it. Based on the name of your blog I would say that you are truly worthy of the award. May God bless you in the next year, Connie….keep writing and keep being a wonderful light in the darkness. Connie–you are so welcome, and so deserving. I just received the Candle Lighter Award and I think it’s really an excellent idea. Not only from the standpoint of recognition, but also from the incentive it gives writers like me to keep striving to reach out and inspire. I’ll be watching for worthy blogs to pass it on to. Thanks so much! Kate…What a lovely award. jakesprinter nominated me for this award, and I followed his links to your blog to find out more about it! Such a uplifting, positive award…..thank you for starting it! You are so welcome! I wanted to bring recognition and affirmation to positive bloggers. Glad you received the award! Let me know if you want the original picture for your badge—Jake’s version is animated and my original is static. The static original is on my blog. Some prefer animated and some static. Kate, I was so touched and humbled when thewomanatthewell nominated me for this award. This was truly an affirmation of my desire to bring the light of God’s love to all those who read my blog. God Bless you for creating this award and encouraging bloggers to flood the internet with words that will uplift and bring hope. Thank you for making a difference…God’s abundant blessings to you! It is a joy to discover the blogs and bloggers that have made it their mission to light up the world. God bless you, too! what a wonderful blog you have created. I love your purpose and the concepts in your blog. I know the Josh Ritter song you are talking about. Sigh. It is SO lovely and inspirational. Blessings to you—and keep on being a light in the darkness. Thank you, Janet! It just seemed like the right thing to do! thank you for your wonderful post and blog! I am thrilled that you received the award. thrilled, too, that your blog lights up your part of the world. Happy New year to you, too. I am so glad that hugmamma passed the award on to you. Thank you for your positive and lovely blog. Regarding the update: Refresh my memory, Jake…as I said, I updated the photo for the award with another blogger’s help–she adjusted the pixels, etc. So that is what I have in the links when I give out the award. Is that what you are referring to? You have been handing out the award to so many deserving blogs/bloggers–that is terrific! If you click on my page for The Candle Lighter Award you will see a ton of recipients. It has grown and spread—I do not think I am going to be able to have a complete list of all awardees…but I assume you are listing who you have handed them out to, too, right? it is surprising and not surprising how fast it is spreading! Most people that receive it pass it on to almost every blog they follow. When you think about it, that isn’t surprising. Why? Positive people tend to gravitate towards other positive people, right? As a result, the progression is geometric :-)! Yesterday one of the bloggers I passed it along to gave the award to 55 bloggers!! I assume you are tracking all of the people you gave it out to, too, right? I am glad I was given the opportunity to have this award. Thank you so much for the joy and hope your blog brings to the world, too! You have a lovely and inspiring blog. I hope that you keep lighting up the world the way you have been.Thank you for quoting me in your post. I am honored to be a part of your joy. Thanks==and all of us who experience your blog are honored by your joyous talent. Pingback: The Candle Lighter Award | "On Dragonfly Wings with Buttercup Tea"
I discovered your page through the award recently given to Becca Givens “On Dragon Fly Wings with Buttercup Tea.” You have started such a wonderful idea, and I am so glad to see that folks, like Becca, are given the kind of recognition they receive for the uplifting, inspiring, and amazing blogs they write. I just wanted to say how wonderful your award is, and I’m looking forward to following some of these links to read other Candle Light Award receivers. Thanks for putting sunshine and light into a world that can so easily slip into the shadows. PS: Would you mind if I draw attention to your blog and your award in a future blog I write? I think that there are folks out there who a) deserve the award and b) might like to nominate a blog they know of that fits your award well. Thank you so much Kate! I feel very hono(u)red you would want to include me in such an inspirational, uplifting and amazing group. I will most definitely post the link so that folks can come and read it. When there is good news to be spread, I always hope, in some small way, that I can pass it along — especially now while I try and travel the paths with sunlight, not shadows, and to follow the road that expresses gratitude and thankfulness. You are surely welcome. You have such a lovely, graceful, upbeat way with words. Oh my—you are a true breath of fresh air. http://phylor.wordpress.com/2012/01/07/the-amazing-things-the-cyberverse-brings-the-candle-lighter-award/ is the link that will take you to the blog I wrote about receiving the candle lighter award. I will add the award badge to my blog site as well. Pingback: Passing the Torch! | "On Dragonfly Wings with Buttercup Tea"
What an excellent idea! I really like the way this award brings bloggers together. I am honored and humbled, to have been chosen as a recipient of The Candle Lighter Award. I was nominated by Sherline, at http://nightshade130.wordpress.com/ Thank you! May the Lord bless you abundantly, and keep you in His loving care! Paulette—i am thrilled that it is bringing bloggers together. That was my hope and dream. That we can shelter each other through life’s storms. That is why God gives us each other. Kate, I cannot begin to express to you how much being given this award means to me!!! For someone to recognize my blog in this way gives me great encouragement and puts joy in my heart to know that what I am sharing is making some sort of positive difference… You are a kind soul full of so much light, thanks for sharing that with the world… This has made my day… Thank you! you made my day too—and your blog deserves recognition! thanks so much for the kind and lovely words. You are an inspiration to each person who reads your blog. I hope that gives you much strength and joy. thank you so much. Love your way with words. I’ve awarded The Candle Lighter to Angela Fish, http://www.caffeinatedautismmom.com/ and Laura Pfundt, http://quillwielder.com/ ! Thanks for creating this fun award! you are so welcome. I added you to my list. you have a wonderful blog and are a terrific writer, too. Kate — I have passed along my first candle lighter award — it was hard to choose who to hono(u)r first, but I picked Sunshine and Chaos (http://sunshineandchaos.wordpress.com) because of her inspirational quotes, kindness and thoughtfulness, her willingnes to discuss her own chronic illnesses and pass along resources to other folks. I wanted to let you know that I had passed along the award (I’m going to email the author and let her know) and I already have an idea who I will nominate next. Thanks again for the award, and openning up a new world for me to light my way through the shadows! I’m thrilled you were given the award! Your blog is a joy, it truly is. Congratulations on receiving the award—and thanks for linking people back so they can read the history. Thank you for the mention, kind words, and link back. Congratulations—and thank you for your marvelous blog. My 2nd candle lighter award goes to Wendy from a picnic with ants http://phylor.wordpress.com/2012/01/16/2nd-candle-lighter-award-picnic-with-ants/ Wendy is a creative, giving soul who kept a candle light for me during my late dark times. I already have a 3rd person in mind, and hope to get her award up and awarded by tomorrow. Thanks again for giving me the award, and the opportunity to share it with folks who have lite candles that helped me find my way at the tao of the crossroads. THANK YOU SO MUCH For YOUR GREAT AWARDS!!!! I’m So Glad that u considered my blog for this special award!!! When I saw Your Nomination I was Stumbled for a minute.This is My First Awards and its not One its Two.OMG!!! Am Much Happy. This gives me Encouragement to be Active in Blogging.I ll do my Best. you help to make my blog world bright. I haven’t been a blogged for long time and this really pats me on the back.Once again, Thanks a Lot!!! Have a Successful Year!!! Keep on Your Great Work! you are so very welcome. Please do stay actie in your blogging. Do let me know if you need information about putting the badges on your blog. I just received your award from Miro at Warrior Poet Wisdom. I’m fairly new to blogging (since April of 2011) and didn’t know blog awards existed! It’s nice to know from where this award originated. I look forward to reading more of your posts. So very glad you received the award! I’m new to the blogging world and I came across this. What a wonderful idea! thank you so much. took a look at your blog today, too. what a lovely blog you have! you’re welcome, Jake. Your work always astounds and amazes me. Thank you for initiating such a positive award, Kate! I am so happy to accept mine at http://dream-hour.com/ and even happier to nominate two very bright lights of the world wide web http://www.birthandearth.com/ and http://abbyplambeck.wordpress.com/! thank you so much too. I am glad you passed it on, too. you completely deserve the award. Hi Kate! I wanted you to know that I’ve posted my receiving the Candle Lighter Award on my blog. I want to say thank you so much for the honor of this award! I’ve also included this link in my post. Thanks again for recognizing my blog with this wonderful award. I do think it’s important to be upbeat! Delightful to meet you Ms. Kate and learn of your “enlightening” Candle Lighter Award. Megtraveling just nominated another site & blogger, breathelighter & Debra, a dear friend of mine. I am simply so excited for Debra to be honored with this award. I remember sitting with Debra when she shared with me her interest in and creation of her blog. Months later, she prodded me to jump into blogosphere too so here I am only at two months old! You all are veterans in my view. What I really want you to know is how I value the inspiration I’m reading in your posts to be positive and encouraging. Sometimes (like now) I feel stalled in writing because I’m not in that mental or emotional place of lightness. Often I wait for the match to light my own candle so when I do post I wish my messages to share warm energy into this arena. Now it is most certainly about Debra and breathelighter–a well deserved award, indeed! Thank you for your generous response to me, the novice. I learn more about the blogging community while being humbled at the writing talents of so many. From such clever word “plays” giving me the laugh-outloud moments to the pain shared by others with pains so descriptive to pull moments of hushed empathy flowing from my soul; sometimes I comment, other times I have no idea what to say. I suppose this is what blogosphere is all about. I will take your words to heart and remember that we need others here to relight our occasional extinguished candle. And so many generous bloggers want us to all be successful. Hooray! thank you so much for giving me this award – I was so chuffed! and here is my post about this – with information about a very worthy blogger that I have passed this award to..
Today I passed it along to 2 recipients who have been through their own person trials and terrors, and yet they still shine a light of positivism and Hope. They have each given me shown me a flame to light my way through hardships. Thank you for creating such a thoughtful award. It truly warmed my heart to receive such a positive and enlightening (pun intented) award! I am so happy that Phylor gave you the award. Thank you for your uplifting, inspiring blog, too. It is up to you. If you want to accept it, go ahead and post the badge on your page; you can write a post about receiving the award, just put the link in your post. You can pass the award on to as many or as few people as you wish. Any time in the future you want to give the award you can, too. If you pass it on, use the link as well so folks know the history of it. If that doesn’t make sense, just comment on back. congratulations on the award. thank you. I will post it and link back. I’ve awarded a joint candle lighter award to two very special bloggers. They are an inspiration to each other and to so many. They light candles of creativity, inspiration, and both received nominations to the recent WEGO health activist blog awards. And, I hope you don’t mind, but I added to this post a candle lighter award for comments. There is a another very special person who, despite her crippling, agonizing pain, leaves encouraging comments, her posts to facebook often are inspiring quotes and links to encouraging and positive websites and blogs. Her own pain makes regular blog entries difficult, but her postings are searingly honest, and she expresses with strong words and poetry her own fears, and experiences. Her comments and facebook activities continue to provide inspiration for so many others I thought that the candle she lights for others (even if it’s not necessarily through a blog) in her encouragement and support deserved recognition. Sorry if I overstepped the spirit and goal of these awards! That is perfect. I think your latest award recipients are definitely deserving. Good for you for passing it on. You absolutely did NOT overstep. You did great!! Thanks, Kate. I wasn’t sure if those who light candles through their inspiration outside the original concept would fit into the project. Thanks for your encouragement. The 7 X 7 is still a work in progress. No problem whatsoever. My concept was to bring recognition to folks ho light up the world. that is the key! No pressure whatsoever on the 7 X 7. You are amazing. you are so welcome~ have a grand day! Congratulations, ron! When you get your link for your blog going, do let me know the link so I can add you to my list of Candle Lighters, OK? Hi Kate I had much Joy sharing your Award with others without the pressure to do so and thanked God for the talent he gave you and your heart of kindness for others, may you be greatly blessed in all you do. Christian Love from both of us Rom and Anne. We need more optimistic and faithful people. Thanks so much, Katia. I took a look at your blog today~and it is wonderful. Toni–thanks. you are so touchingly kind. let’s bring the kids home. NOW!! Thank you so much for doing this. There s alot of negativity in the world and anything we can do to make this old world a better place is wonderful. I’m also a big believer in Pay It Forward. I think everyone should be encouraged to watch this movie. It may be an older movie but the message is still there and should be heeded by more in these trying times! thanks for mentioning me—and i am so happy you received the award!